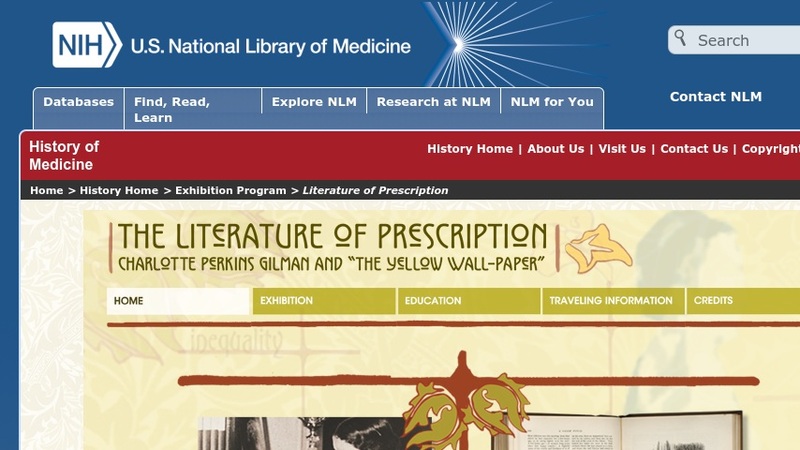 The Literature of Prescription: Charlotte Perkins Gilman and "The Yellow Wall-Paper"
Those visitors unfamiliar with the unsettling and terrifying short story, "The Yellow Wall-Paper", by Charlotte Perkins Gilman, are fortunate that this National Library of Medicine website provides a PDF of the story in its original form that first appeared in 1892 in The New England Magazine. At the bottom of the homepage, visitors need just to click on the image of a page underneath the heading Digital Documents, to read the dozen page short story. The story shed light on the treatment of women by the medical establishment, especially in regard to mental health issues. The "Education" tab near the top of the page, offers several high school lesson plans and a higher education module, for use with the exhibition. The high school lesson plans are for an English class and a Health Education class, and are about women and medicine, and mental health, past and present. The higher education module takes a look at 'The Troubled Mind in Medicine and Society".